Do you feel unmotivated to go out and photograph because you don't live near gorgeous locations? Let me tell you that you can make beautiful and memorable photos using your own front yard! I've written the first part of this topic photographing my daughter during the fall season. Check it out here! This post is for the winter season. Enjoy! "I'm looking for help with this old photo of my grandmother. I am finding a lot use bright and insane colors that people would not have worn and unrealistic looking with other sellers...." says my client and now friend, Alice.S. Have you come across such photo restorers/retouchers? ​This was the beginning of a beautiful working experience. Alice wanted to have this photo of her grandmother restored as a gift. I'm so glad that she got what she wanted and with stories to tell too. Read on for more on the before and after of this amazing photo! 1961 baby photo restored like new again - Magic! Photo Retouching your child into a magical dream! I am celebrating the anniversary of 14 years of marriage! I'm celebrating by not only offering a wonderful special for all of you married couples but as a gift for myself. 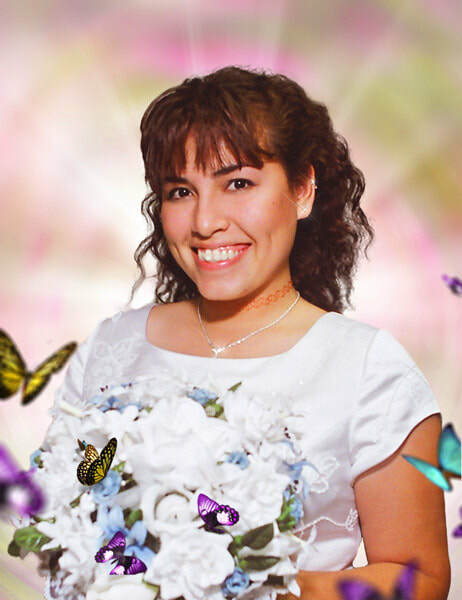 See, it has been 14 years and only now have I been able to photo retouch my untouched wedding photos. I wasn't in love with my photos and felt so depressed about them all of these years. But finally, I've done something nice for myself and have been retouching them all and yes! I will now make a beautiful photo book with these newly enhanced images. And now I'm thrilled to announce a FREE PHOTO BOOK or CANVAS offer! Read on! Wonderful things in life happen that makes us better like those special people in our lives who enrich us, strengthen us, make us happy who we have our fondest memories. You're here because you are enjoying your DSLR or digital camera and taking photos of your family but perhaps when you look at your photos something seems off. For instance, you're surprised at how your double chin is protruding. In fact, where did it come from? Your husband's form may seem more pudgy than how you usually see him, or you're not sure how to pose your family during the family reunion. You're here because you are enjoying your DSLR camera and taking photos of your family but perhaps when you look at your photos something seems off. For instance, there may be too many shadows, you don't know how to position yourself in relation to the sun, or you may be missing on important details that you'd love to cherish decades later. Maybe you're new to photography and would like some help. The trick to making a great magically enhanced photo art is to start with good and eye candy photography. Then there are the fun projects of putting together a photo album, a wall of photos or collage. What should be included? Happy Birthday! Is your child a May baby? ​Great! And I have a gift for your child! How about an adorable customized and personalized photo? All you have to do is send me your favorite photo of your child. Maybe a special posed photo during their birthday party? And I will surprise you with personalization including their name, age, date, "'Happy Birthday" text, and sweet special effects. My philosophy is that photography should lighten up the heart and the eyes with vibrant color, light and Majesty as memories flood back into the mind and soul.